and decided to work up this card. 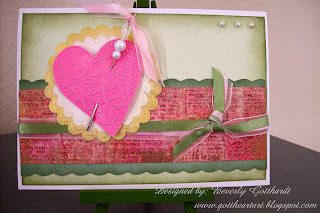 I had made the heart one Wednesday afternoon when my card making buddy Cheryl came over to play, so it's been on my table for awhile waiting for a card. Then the pink gold glittery paper in the middle I found at Gotta Scrap gottascraprockwall.com in Rockwall, Tx. on a Saturday outing with Cheryl and my other good card making buddy Linda. What a neat store they have. They are one of the only independent stores left in our vicinity, it was a treat to meet the ladies that own the store, they're a talented bunch. Those were the new and neglected things in my stash. I hope you like my endeavor and I look forward to participating in your next challenge. Supplies: Card Blank 6 1/2" X 5" White-Value Pack, Hobby Lobby, Lt. green card stock, CTMH-Garden Green card stock, Iron Orchid Designs-Little Flirty Secret Shimmer paper, white card stock, Twinkling H2O's Radiant Rain-Solar Gold, Craf-T Products Metallic Rub-Ons-Golden White, Inks: CTMH-Z2125 Grey Wool, Z2120 Garden Green, green and pink ribbon-Michael's, Crystal Stickers Pearls, Stampin Up-Pretties Kit, Spellbinders Nestabilities-S4 124 Classic Scallop Circle Lg, Cuttlebug Emboss & Cut Hearts. Gorgeous, as always! I especially like the ribbon combinations and wish I had bought some of that paper at Gotta Scrap LOL! Such a beautiful heart Beverly!